Elizabeth is a 2006 graduate of Baylor College of Medicine’s PA Program. Since graduation, she has worked in pediatric critical care at Texas Children’s Hospital in Houston, Texas. She is now also on the core faculty at Baylor’s PA program and directs the didactic and clinical pediatric curriculum. She served on the Bright Futures Expert Panel with the American Academy of Pediatrics whose work involved creation of the 4th edition of the Bright Futures Guidelines. Her professional interests include breastfeeding education, child safety, child development, and promotion of well-child care. She lives in Houston with her husband and four young children. Genevieve is a 2001 graduate of the Duke Physician Assistant Program. 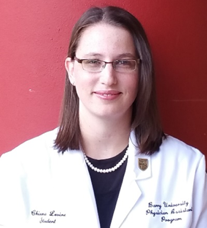 She joined the faculty of the Saint Louis University Program in 2008, where she serves as an assistant professor and Director of Clinical Education and practices clinically in ambulatory pediatrics at Cardinal Glennon Children's Medical Center. Prior to this, she worked in ambulatory pediatrics and pediatric endocrinology at the University of Kansas Medical Center. Professional interests include perinatal health and serious games. Outside of work, she enjoys reading, running, and spending time with her husband and four young children. Courtney has been a member of the SPAP Board of Directors since 2012, first as the Student Representative, then Secretary, and now President-Elect. She is a 2013 graduate from Chatham University’s Physician Assistant program in Pittsburgh, PA. Since 2013, Courtney has worked in the Orthopaedics Department at Nationwide Children’s Hospital in Columbus, Ohio, where she is also a member of the APP Advisory Council. She is also a preceptor for Ohio Dominican University’s PA program. In her free time, Courtney enjoys reading, traveling, and supporting her favorite sports teams including the Columbus Crew, Ohio State Buckeyes, and Tottenham Hotspur. Heather Gilbreath is a 2006 graduate of the University of Texas Southwestern Medical Center Physician Assistant Program where she has also served as a Clinical Instructor since 2010. She is employed in the Neurology Clinic at Children’s Health Dallas where she cares for patients with neuromuscular disorders and serves at the Neuromuscular Clinical Coordinator. In 2013, Heather received the Children’s Medical Center Advanced Practice Professional award for her efforts in education and advocacy. Tara currently works at Texas Children’s Hospital within the trauma surgery department. She started working at Texas Children’s Hospital in 2016 after graduating from the Mercer University Physician Assistant Program in Atlanta, Georgia. In January 2018, she completed the Texas Children’s Hospital Surgical PA Fellowship, a one year program that allowed her to rotate through numerous surgical subspecialties. The experience was very beneficial for her current position within the trauma department as the majority of the patients require multidisciplinary care. Tara joined SPAP in 2016 and was a Member-at-Large for two years before recently transitioning into the position of secretary. Tara is originally from the Washington DC area and enjoys running, yoga, and spending time with her family and fiancé. Sarah is a 2013 graduate from Philadelphia College of Osteopathic Medicine. She completed a physician assistant residency in neonatology at The Children's Hospital of Philadelphia where she now works in the neonatal and infant intensive care unit. She has served since 2015 on the SPAP Board of Directors as Treasurer and Member at Large. When she is not at work Sarah enjoys being outside, photography, traveling and spending time with her family and dogs. Laura will be a 2017 graduate of the University of Texas Southwestern Medical Center Physician Assistant Program. Prior Physician Assistant School, she practiced as a Speech-Language Pathologist specializing in neonatal and infant feeding as well as pediatric brain injuries. Laura currently lives in Dallas, Texas and enjoys running, travelling, and spending time with her family. Chiena is currently a PA student at Barry University in Miami Shores. She is scheduled to graduate in December 2018 and is looking forward to joining the ranks of Pediatric Physician Assistants. While enjoying all things pediatric, she has a special interest in pediatric rheumatology and oncology. Prior to PA school, Chiena trained as a Diagnostic Medical Sonographer with an emphasis on pediatric echo. She worked as a Medical Secretary and Assistant at a pediatric practice in Baltimore, as well as a substitute teacher and special needs facilitator in multiple states. While not studying for the PANCE and completing school assignments, Chiena enjoys working with children, reading, solving puzzles and transcribing Braille. Brian is a past-president of SPAP and is currently serving as the AAPA’s liaison to the American Academy of Pediatrics. Brian has practiced in pediatrics since graduating from the Duke PA Program in 1999. He worked in primary care for 6 years, and has been at Children’s Healthcare of Atlanta practicing in pulmonary diseases for the last 13 years, where he also is PRN staff in the urgent care network. Brian is a PALS instructor, volunteers at asthma camp, and coordinates student rotations within his practice. He is a scifi geek whose 3 cats are named after Star Trek characters. He also enjoys birdwatching, gardening and traveling.